2009 was a year that saw a number of interesting moments in the WWE. However, none could have been better than the essential feud on Smackdown for the World Heavyweight Championship between CM Punk and Jeff Hardy. When I first started watching the feud between the two, I remember thinking that this was a great way to push Jeff to a higher level and an opportunity to get Punk to a significant but lower level than Hardy. How wrong I would be is what will drive this article. When CM Punk first won the MITB briefcase for a second straight time, I expect him to set his sights on John Cena, Edge, Triple H, or more likely Randy Orton. It seemed as if he was in prime position to take the belt from one of the top heels at the time, as he was still a face. 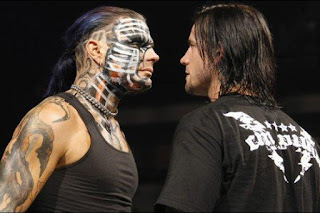 When Jeff Hardy and Edge went one on one at Extreme Rules for the World Heavyweight Championship, I was slightly surprised to see Jeff walk away with the victory. I was even more surprised to see the perfectly executed slow heel turn of CM Punk by taking advantage of a beat up and tired Jeff Hardy who had just won the championship. It seemed as if Hardy might have a twist of fate when he kicked out the first GTS from Punk. However, a second GTS sealed the fate of Jeff and he walked away with the title in a huge moment. Punk used the opportunity to walk away with the World Heavyweight Championship and with that, we were off to the races. The truth of the matter is that Punk and Jeff were essentially the perfect opponents for each other, even though they weren't necessarily fond of each other in real life. Punk, a well known Straight Edge guy was on his way to a monumental heel turn that would change his career, while Jeff was seen as the carefree, Charismatic Enigma who lived life as he saw fit. They were polar opposites in style as well in the ring. Jeff was more flashy and into high flying, while Punk was a bit more well rounded, utilizing a bit of high flying mixed with an unorthodox style of offense and a bit of a submission game. After Extreme Rules, it seemed as if Punk was trying to prolong the heel turn and truthfully, that was the best option. After explaining why he did what he did, it seemed as if the plan for the WWE was to include Edge in for his rematch at some point, but keep the focus on Jeff and Punk. At the upcoming PPV The Bash, Jeff vs Punk was set for one of the main events for the title. Jeff would get his rematch. It was in this match that the heel turn was further clarified as Punk cheated to hold onto the title and lost by DQ. After taking a cheap shot at the referee that led to him being injured, the growing boos that Punk had started to receive were becoming more and more justified. Truthfully, during this period, I was never a fan of Jeff as I felt he was overrated. His promos were awkward, he wasn't believable as a singles competitor mostly, and his matches were just good at best. We hadn't seen Jeff find an opponent with such a disdain for him that it felt real. That would change with this feud. The promos that Jeff cut after The Bash were pretty good and there was one instance where you could feel their real life issues spilling over into their work. Jeff and Punk would get another match set for Night of Champions, as Punk claimed that his DQ was the result of an eye injury that caused him to kick the referee. Granted, no one really bought that excuse, and it was clear that Punk was the heel, they still tried to drive home that maybe Punk was actually innocent. As Night of Champions near, Punk and Hardy would engage in promos where they went from talking about one man taking shortcuts in the ring to one man seemingly taking shortcuts in life. Punk would begin his descent into the Straight Edge Messiah persona that many would come to love him for. He would criticize Jeff for making so many mistakes and using drugs as a crutch and his carefree disposition as an excuse for his lack of drive and motivation. As a fan, watching Punk get so real with Jeff was a mix of uncomfortable and welcoming. Punk shines best when he's being real and his promos seemed to be completely believable. After telling Hardy that he was a failure and had suffered through multiple failed drug tests and suspensions, Punk became the heel we all needed at the time. As with most heels, Punk wasn't wrong in his criticism of Jeff, someone who had many opportunities and let them go to waste numerous times due to his bouts with drugs. Punk geared up for Night of Champions and he kept on laying into Jeff until the moment arrived. There would be no false finishes or nonsense to close their Night of Champions match out however, and this is where the feud almost took a turn for the worse. 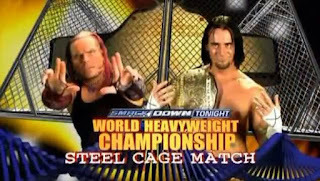 Jeff Hardy won the World Heavyweight Championship back. I didn't think that was the right move. Jeff beat Punk cleanly, and the feud continued on, but I felt as if Jeff winning the title was only done to prolong the inevitable. The rumor mill was buzzing about Jeff supposedly leaving the WWE soon, so I didn't think he needed one final title run, but the WWE thought so. Be that as it may, Jeff won the title back, and he was now in the driver seat. However, there was one last turn in this story before we arrived at the end and it featured the man who was beside Jeff his entire career: his brother Matt. Matt had recently betrayed and feuded with Jeff earlier in the year and seemingly the deck was stacked now against Jeff with Matt being used as a special enforcer for the Jeff vs Punk rematch on Smackdown. However, a funny thing happened. Matt Hardy turned face to help his brother. After Matt turned face again to help Jeff, there was one FINAL contest set to finish off the Jeff vs Punk feud and it was fitting. TLC. Tables, Ladders, and Chairs. At SummerSlam. The TLC match was amazing between the two and Punk would end up regaining the belt in a great main event. With Punk regaining the title, the feud would basically be at an end, and with the return of the Undertaker to feud with Punk going forward, one would think this spelled the end for Jeff. It was definitely the end for Jeff and the end of their feud, but not before one final encounter, as Jeff got his rematch on Smackdown a few days later. The rematch on Smackdown was a Steel Cage match that had the huge stipulation of "Loser Leaves WWE" and Punk would send Jeff packing. Punk retained his title, and came out of the feud looking like a nearly unstoppable heel. Punk was able to tear apart Jeff on the mic, go toe to toe with him in the ring, and take his title from him two times and run him away from the WWE for years. The real issue seemed to come after Hardy left the WWE, as Punk would take more shots at Jeff following his departure, causing more of a rift between the two, of which I'm sure Punk was not worried. Still, the real life issues between the two combined with a nice build to Punk's heel turn and the great matches and promos made this a truly great feud and my favorite feud of the year in 2009. Though Jeff has had some great opponents in matches, I think in a feud, his best work was with CM Punk. CM Punk vs Jeff Hardy was one of the greatest feuds of the WWE in the recent era.